Although our immediate school districts include 1545, 110, and 299, Testa provides the freshest produce to schools all throughout our distribution area. Partnering with schools gives Testa the opportunity to provide healthy food alternatives to students. Teaching children the importance of what they eat and where their food comes from is an initiative we take very seriously here. Testa will work with your school kitchen to develop your menu and make sure there are plenty of fresh fruits and vegetables on there. Whether you need help stocking a salad bar for the cafeteria, creating a menu, or are looking for a specific item, pack size, or packaging, Testa is here to help. Our sales reps will answer your questions and help you develop your lunch-time program. If you have a need for it, we have the ability to provide marketing material for your cafeteria or classrooms to further promote a healthy lifestyle. If you are interested in partnering with Testa, please contact us at info@testaproduce.com to learn more. We help outside of lunchtime too! 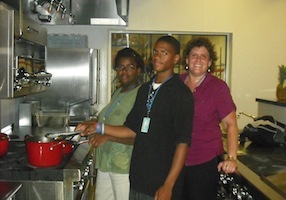 Debbie poses with a few of our CPS Interns, showing them a behind the scenes look at where their food comes from.